Craftin' Caro: Bringing home the GOLD means FREE Shipping across CANADA! Bringing home the GOLD means FREE Shipping across CANADA! 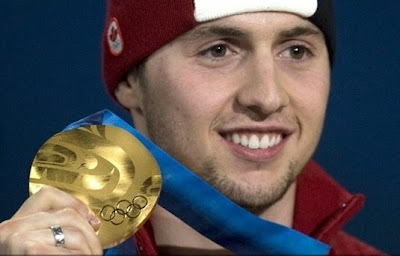 If you're a Canadian blog reader here, you already know that Bilodeau won the gold medal in men's moguls this weekend. This win marks the first time a Canadian athlete has captured the top Olympic prize at a Canadian game, and cheers erupted from sea to shining sea! It was a spectacular sight to see, as was the medal ceremony last night. Ahhh... who says Canadians aren't patriotic?!! To help celebrate, I'm offering free shipping on all new Stampin' Up! orders placed with me this week only (Tuesday Feb 16 - Monday Feb 22). Orders over $60 can be shipped direct to you, under $60 they must be picked up at my studio. The excitement will continue as the Olympics do, and in the meantime, congratulations also go out to Jennifer Heil for her silver in Ladies Moguls, Snowboarder Mike Robertson with another silver medal in Men's SBX, and Kristina Groves for her bronze in the Ladies 3000m speed skating.